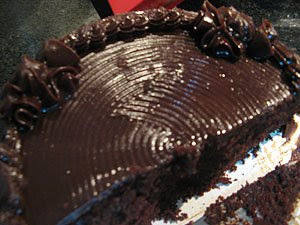 Cake has always been my favorite since I was a child, most specially the luscious chocolate cake. Because of my craziness to cakes, I'd able to learn baking when I was in high school. I first baked chiffon cake, which of course tasted and looked awful. But for a reason of experience, that would be OK..lol... Later, my chiffon cake became perfect with the training of my high-school THE teacher. 1. Cream butter; add sugar gradually. (Make sure butter is soft when starting to cream). Cream till light and fluffy. 2. At low speed, add eggs, one piece at a time, mixing thoroughly after each addition. Add vanilla. 3. Add Mix B in fourths and Mix A in thirds alternately, ending with Mix B. 4. Bake at 350 F for 25-30 minutes in two or three 9″ round layer pans. Cool 10 minutes. Turn out onto wire rack. 5. Add fudge icing (see recipe below) to the top of one layer then combine the two layers to ice the whole cake. 1. Mix milk and cocoa with wire whisk or wooden spoon until smooth. Strain through a wire strainer. 2. Cook mixture in double boiler. Stir occasionally- when thick, remove from fire and add butter thoroughly. 4. Use this icing right away. Keep bowl in double boiler to maintain warmth. 1. You can decrease the cocoa down to 1/3 cup. 2. Icing starts getting thick when you see thick icing clinging to the sides of the bowl. Continually scrape sides of bowl until icing becomes very thick. 3. Do not over cook or else you will have a fudge candy. The nurse licensure examination was held last June 1 and 2 this year and another batch of new registered nurses are named. There are 27,765 pass the nursing board exam or about 43.07% who pass out of 64,459 who took the nursing licensure exam, official result from PRC. Practically speaking, I welcome another batch of professionals without job! Really, there are a lot of nurses in the Philippines who are unemployed due to superfluous supply of nurses, hmm, including me... The country produce thousands of nursing graduates every year that makes the supply of said nurses overflow. Hence, this resulted to unemployment. For the Rn's to gain hospital experience, many of us are contented to volunteer to most hospitals without having a salary just to get a certificate as proof of evidence that hospital duties are done. This will further guarantee a nurse to be hired soon, locally or internationally. The reality of a fresh graduate is to land for a job, much better if it is related to the course taken. Hard works were exerted to finish a certain course, specially nursing, plus another extra hard effort utilized to review to pass the board exam, not to mention the financial matters. After all those hectic activities and times spent, securing a job is the top aspiration for the new grads. Ironically, as most universities and colleges generate more nursing graduates, who eventually will become registered nurses, the chances of acquiring a job are slimmer due to many causes - may it be due to the crisis the country is facing right now, thus, many companies and hospitals are having redundancy, may it be cost-cutting reason, so hiring of additional staffs ceased, and so on and so forth. Speaking of salary, our (nurses) salary is too little, not enough to feed the family. This is one of the reasons why nurses migrate to another country for a greener pasture. To some newly grads, instead of looking for a job right after graduation, they choose to take international examinations like NCLEX, IELTS, etc., to be qualified to work to foreign country other than our own Philippines.